Ad monetization has become a major revenue source for many mobile app owners in different verticals, such as gaming and entertainment. App owners cash in ad revenue by displaying ads on rewarded videos, offer walls, interstitials, banners etc. 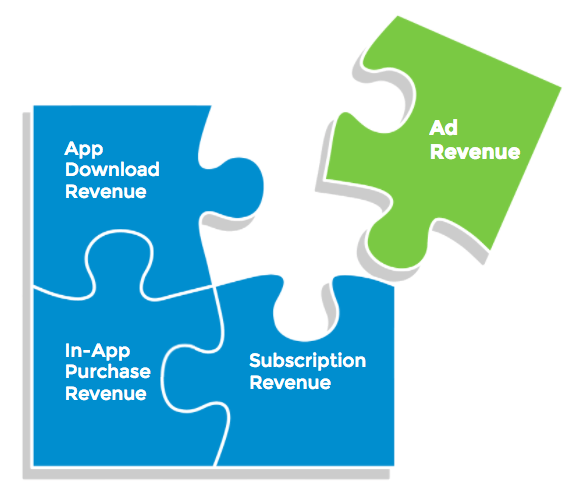 AppsFlyer's Ad Revenue attribution feature allows you to combine the ad revenue data with the in-app purchases and subscription revenue data to determine the full LTV of your users. By matching the full LTV of your users with media cost data, you can automatically determine the actual ROI of your mobile campaigns and dramatically optimize your results. The following guide explains how to set up ad revenue tracking with different scenarios, which networks support this integration, examples and limitations. Select the trigger in-app event of your app that best represents the ad monetization trigger. 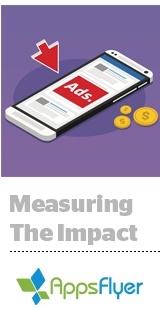 Usually this event is sent for each ad impression, e.g., ad watched or watched video. AppsFlyer queries the ad monetization network for the app's ad revenue per Geo in the last day. AppsFlyer calculates the eRPA (Effective Revenue Per Action) by dividing the ad revenue with the number of instances of your chosen trigger event. For every instance of the trigger event, AppsFlyer creates a "_monetized" event, that includes the eRPA, e.g., ad_watched_monetized. The ad revenue data is accumulated with the in-app purchases revenue data on AppsFlyer's aggregated data in the dashboard (but not as part of the raw data). If you don’t want to generate a specific in-app event, you can use the af_app_opened event, which is triggered with every user session. However, this event pertains to ALL launching users, and therefore you have no indication of the actual users' willingness to watch ads. It's also applicable if you show your users exactly one ad every session. Many clients want to work and try more than one ad network at a time to find the most engaging choices for their users. There are a few choices to track several monetizing networks at the same time, with different pros and cons. What: You can use a single event such as ad_watched for ALL ad revenue events. This automatically produces the ad_watched_monetized event with the monetization details. Pros: Most simple to implement. Cons: Can't tell the quality of different monetizing networks like the number of clicks and ad revenue each network brings. Bottom line: If your main goal is finding which source/campaign gets users with more tendency to click on ads, but not to compare ad monetization networks performance, this option is sufficient. What: Each network gets its own event for ad watching, e.g. ad_watched_admob or ad_watched_vungle. Pros: Full visibility and ability to compare the monetizing networks on the dashboard in addition to the raw data. Cons: Ad revenue isn't accumulated under a single event. Could be as many events as the number of monetizing networks used. Bottom line: Allows for easy comparison of monetizing networks right on the dashboard, but the total summary of ad revenues is separated among different events. Mobile apps may use one or more ad monetization networks, either directly or by using a mediation platform, e.g., IronSource, Admob, DoubleClick (DFP) etc. 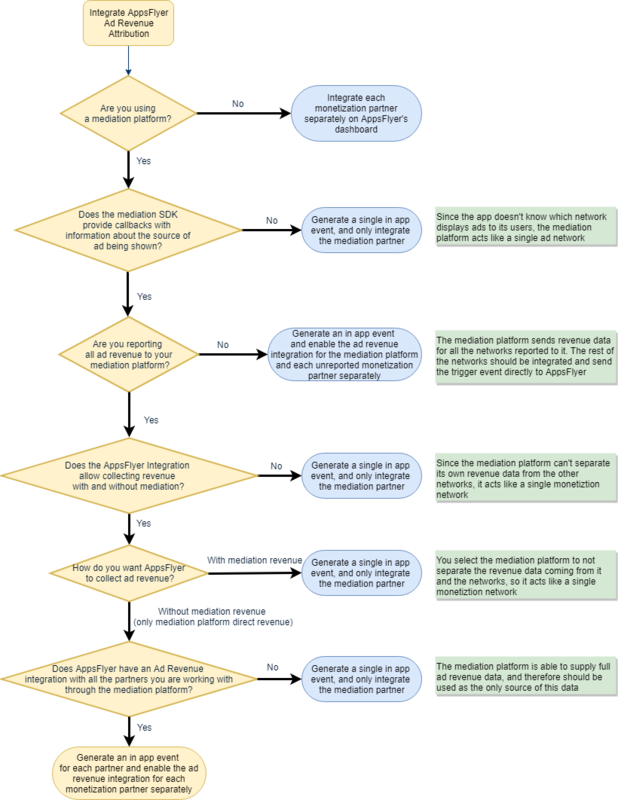 If your app is using a mediation platform's SDK, you may be reporting double revenues. To avoid this, follow the flow chart below to find the correct way for you to integrate with monetizing networks and mediation platforms. AppsFlyer requires these platforms to integrate with it to perform ad monetization tracking. You can check if the ad monetization platform you use is already integrated with AppsFlyer in the Supporting Networks tab. Admob can act as a mediation platform but in AppsFlyer it only reports ad revenue that is generated via the Admob network. Details about DoubleClick Ad Revenue integration. Now known as Google Ad Manager. The data for ad revenue attribution is displayed on the overview page under the Aggregated Performance Report table. The Revenue column includes ad revenue, and any other revenue sources as well, e.g. revenue from in-app purchases. 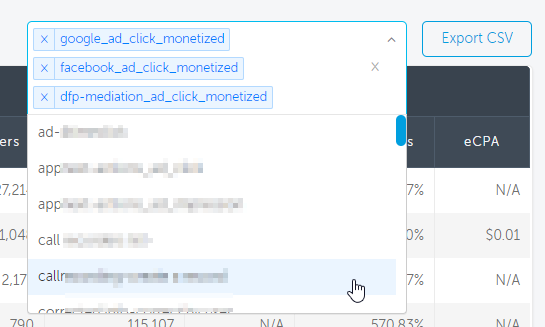 Select to see the monetized events in the report to see the exact ad revenue per media source / campaign / ad set / ad level or even per specific countries. You can also go to the Events page to see your monetized events data. There is an interesting piece of information on the last column, Average Actions per User, which show you the tendency of users from any source to engage with the ads your app presents to them. Note that ad revenue data is also included in the Cohort and Activity Reports. Ad revenue data is LTV on AppsFlyer's dashboard, meaning it includes events performed throughout the lifetime of users, who installed during the specific date range. It's a powerful tool for showing the quality of your users from different sources over time. As your users continue launching your app and engaging with ads, their LTV continues to rise. Therefore, the LTV of past users should be higher than the LTV of recently acquired users. If you want to see your total ad revenue from ALL users during a specified date range go to the Activity page. More about LTV vs. activity data. The ad revenue includes revenue accumulated up to the previous day, as AppsFlyer pulls the revenue daily for the previous day, after 5 PM GMT. Although the original trigger event (e.g., ad_watched) is displayed, its parallel ad revenue event (e.g., ad_watched_monetized) is displayed only from the following day for UTC (and UTC-), and after two days for UTC+ timezones if your dashboard is localized. The ad revenue events are not available in the Raw Data Report. The ad revenue events are not available through the in-app event postbacks and Push API. The Retargeting dashboard does not display ad revenue events. Agencies are not allowed to access ad monetization platform configuration. 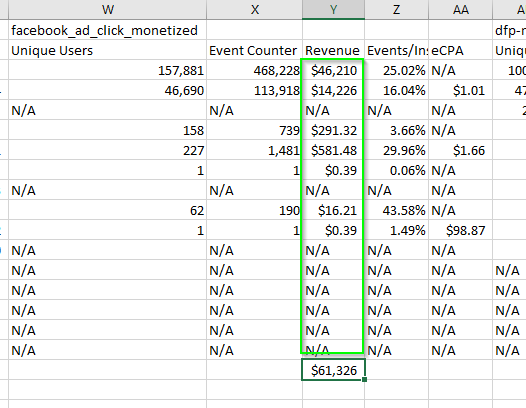 Click on the accordion below to see an Ad Revenue reporting example. 3 users installed the app on December 31, 2017. Over the course of 4 days after the installs, these users are shown ads from various monetization platforms as illustrated below. As mentioned, ad revenue is tied to the user’s Lifetime Value. As a result, the time period you select in the dashboard represents the cohort of installs for which the revenue is aggregated up until the current time and day. Let’s examine the report from two different date selection and understand the reporting. In this case the cohort is the install date and the current day is 5/1/2018. All the revenue generated is been tied back to the acquiring source and represented under the user’s LTV. How Can I Get the Total Ad Revenue from Each Platform? Note that this total ad revenue is LTV data, i.e. it's the entire revenue generated by a monetizing network for your app from users, who installed during the specified date range. Is there Ad Revenue Data in the Activity Page? The activity page reports on the combined revenue from in-app purchases, as well as from ads. However, since the ad revenue data is sent to AppsFlyer on a daily basis, the activity page's ad revenue data is always assigned to the next day for UTC and to the day after for UTC+ time zones. On Monday midnight AppsFlyer gets a total ad revenue of $1000 for Monday for your gaming app - "Zombie Talks". While the AppsFlyer LTV data on the overview page shows the $1000 recorded for Monday, the activity page shows it for Tuesday (while its Monday data shows Sunday's ad revenue).